It's truly amazing how time flies by. Today, Monday, August 22, 2016, marks the 10-year anniversary of WrestlingNewsSource.com. I must say that I take pride in being part of what has become one of the leading pro wrestling websites in the world. We currently have more than 77,000 Twitter Followers and a whopping 504,000 Facebook Likes. While we always hoped that we could have a good site that people would enjoy, I think it's safe to say that neither myself, Ben Kerin, Krysti Fairchild, Kenny Williams, Elio Cannella, or any of our other staff members, ever thought in a million years that our site would grow as large as it has. Every single day, everything we post is seen by wrestling fans all over the world, in countless cities and countries. We truly appreciate each and every single one of our loyal readers. 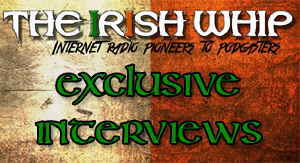 I remember way back in 2006 when I first started talking to Ben Kerin in the old "Wrestling Pit" forum, which was part of The Irish Whip wrestling radio show. TIW had some notable guests, including Jerry Lynn, Raven, Petey Williams, and several others. TIW was hosted by J.P. Griffin and "Big" Joe Nee. 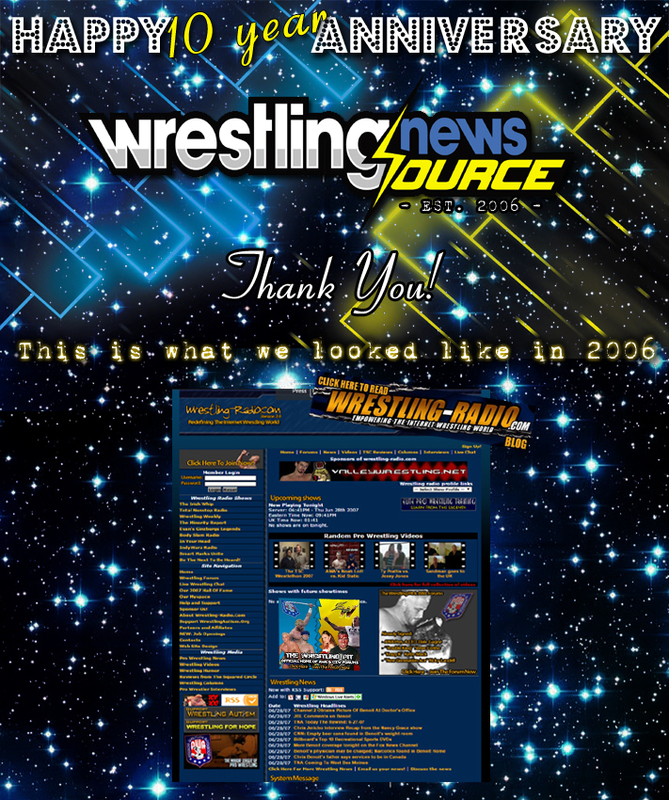 The main page of TIW also included a wrestling news section, and eventually it evolved into Wrestling-Radio.com, which of course would later become WrestlingNewsSource.com. "The Wrestling Pit" was a fun forum, and was even the official forum for both Combat Zone Wrestling and the American Wrestling Alliance, which as fans may recall, was something of an offshoot/unofficial continuation of Verne Gagne's legendary American Wrestling Association. Our forum also had a section that was led by former ECW, NWA, and AWA World Heavyweight Champion Steve Corino, where forum members could chat with Steve and ask him questions. We even had our own little TWP Hall of Fame section, which was run by myself and our old friend Kenny Strickland. As technology and life in general are always evolving, so too did WNS. Back in those days, we had a MySpace account which had a fairly large following. Around the 2009/2010 timeframe, as both MySpace and our own "Wrestling Pit" forum started to fizzle out, we kept up with the times and moved on to Twitter and Facebook. Needless to say, our current social media accounts have made WNS much larger than it ever was back in the early days. For me personally, WNS has been a way for me to express my passion for professional wrestling and connect with fellow wrestling fans around the world. In all honesty, professional wrestling and combat sports are the only sports I've ever followed. I've never followed football, basketball, baseball, soccer, golf, hockey, swimming, racing, or any other sports. While most people around me will often talk (and sometimes debate) about football or basketball, I'll be sitting there thinking about professional wrestling, totally clueless as to what's going on in any other sports. Many would argue that professional wrestling isn't really a sport, which could be a fair argument if you want to be technical about it. Professional wrestling is entertainment, and in my opinion, it's the greatest form of entertainment in the world. When people ask me why I like "that fake wrestling stuff", I simply tell them that watching professional wrestling is just like watching the Rocky movies or any other fighting/Martial Arts movies. Of course Sylvester Stallone (Rocky Balboa) is not actually "fighting" Carl Weathers (Apollo Creed), Mr. T (Clubber Lang), Dolph Lundgren (Ivan Drago), or any other opponents that the Rocky character faced in the ring. People understand that while they're watching the Rocky movies, just like professional wrestling fans are fully aware that what we're watching is not actual fighting. But just like Sylvester Stallone did for the Rocky movies, professional wrestlers have to be highly-conditioned athletes and keep themselves in superb physical condition in order to perform in the ring at the highest level. And just like stuntmen in movies and television shows, there is a very real possibility that professional wrestlers can get seriously injured in real life while performing their stunts (moves) in the ring. This is my response when people try to say that professional wrestling is "fake" or "stupid" or "pointless" or whatever else. It's not meant to be confused with Olympic-style wrestling, boxing, mixed martial arts fighting, or any other combat sports. Professional wrestling is theater. Professional wrestling is storytelling. Professional wrestling is just like any other fighting/Martial Arts shows, but with a greater physical risk to its performers. And of course, professional wrestling has much more outlandish and colorful characters than most of those shows as well. "Wow... it's so hard to believe that it's been TEN YEARS since WNS first launched! It literally feels like it was only yesterday when I first joined the website and, even better, got to know such an amazing group of people such as Ben, Krysti, Caylon, Elio, Nicholas, and others! Pro wrestling is something that I, like many other fans, grew up with, so when I was presented with the opportunity to join WNS, I couldn't pass it up. I first joined the website back in 2008 when WNS was known as Wrestling-Radio.com. Not long after, I was able to host the website's very first weekly podcast, “Ask Wrestling-Radio.com,” in which readers and fans were encouraged to submit questions every week that were answered, as well as being informed of all of the latest news from the pro wrestling world (though our current podcast team has DEFINITELY raised the bar since that time!). Two years later, Wrestling-Radio.com was re-branded into WNS, and for me, it's still as fun and exciting as it's always been! On top of working with a great group of people, perhaps the one thing that I've enjoyed over my eight years at WNS is being able to interact with our fans and readers, as well as help keep them all updated on all of the latest goings-on in the world of pro wrestling, whether it involves show results, hot signings, or even all of the latest backstage gossip. No matter what the job involves or who I get to work alongside, I couldn't ask for anything better! Here's to ten more years!" "For me it all began on June 7, 2011. Though it may sound like I'm joking and being funny, I literally found WNS by accident. I was looking up wrestling podcasts that are currently and continuously releasing new episodes. I found one called Wrestling-Radio.com. I tuned into a few episodes and liked what I had heard so kept following for new episodes. Then one day I went to Wrestling-Radio.com and it kept re-directing me to WrestlingNewsSource. It had been frustrating me at first because I had no idea what WNS was. A few more attempts with the same results so I figured out that Wrestling-Radio had changed to WrestlingNewsSource. February 22, my dad got quite the birthday gift; he was diagnosed with cancer. He would go to the hospital every week to get water taken out. While my mom took care of things on that end, I stayed home taking care of things here. It was not easy for me knowing everything that was going on. I was still working at the library but it was only twice a week. I needed something more to take my mind off things. June 7, I was on Facebook and saw a post from WrestlingNewsSource needing someone to cover the weekly Raw, Smackdown, and TNA shows. I brought my expectations down to zero and took a chance on emailing WNS. I said I'd been watching WWE for over 30 years and during the Monday Night Wars I had even created, for fun, "Raw Is Nitro" with WWF vs WCW. I was not expecting what happened later that day. I received an email from Ben around 5pm offering me the position of Raw/SmackDown coverage. I didn't have to think twice. WNS was there to help get me through the dark days and take my mind off everything that was going on. I had gotten sick a few days later and was hospitalized. WNS was still there. A lot of people ask why I'm so loyal to WrestlingNewsSource. I can say no anytime I want and there are times that I have. The reason I don't say no is that between 2011 and present, I have seen WNS ask people if they can help with covering shows/PPV's only to be left hanging at the last minute. I'm not everyone else. WNS has been here for me for the past 5 years so when they need me I will be there. Some people get to live out one dream. I get to live out two dreams. The first was in 1996 with working at IBM. The second, I continue living out every Monday, and now Tuesday nights. A 13-year-old sitting in his room playing with his WWE action figures, creating matches, had to have lead somewhere. WrestlingNewsSource is where it's lead me. And besides having the best job, I get to work with an amazing staff at WNS. Congratulations on 10 years, WrestlingNewsSource." Indeed, it's been an incredible 10-year run for us here at WNS, and we certainly hope that our readers have enjoyed following us as we've continued to grow. As of right now, professional wrestling definitely seems to be in a transitional phase that is proving to be very exciting to watch. WWE has reinvigorated themselves with the Brand Extension, as well as the always-entertaining NXT developmental territory. Many fans have noted that TNA also seems to be turning things around for the better as of late. ROH continues to deliver a hard-hitting, fast-paced, and downright fun to watch product, as they always have. AAA's Lucha Underground offshoot promotion has proven to be a unique alternative that many fans enjoy as well. Even the New Japan Pro Wrestling promotion has made their presence felt here in the United States since signing with AXS TV back in November of 2014. As professional wrestling continues to venture into this "New Era" as it's been called, WNS will continue to provide our fans with the latest wrestling news and inside scoops, articles from our staff, and the wildly popular WNS Podcast, which has featured many high-profile wrestling stars. We hope to see all of you for the next 10 years and beyond!